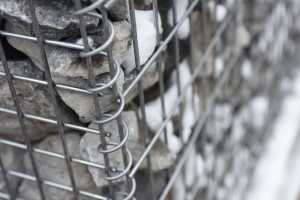 Wire mesh Gabion baskets are used in landscaping and civil engineering projects where a stone retaining wall is required for decorative or stability purposes. 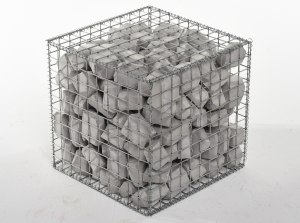 Our Galfan steel mesh Gabion baskets are manufactured from 3mm dia. steel wire, and are supplied with a 3" inch / 75mm square mesh hole. The wire mesh is welded at each intersection / corner. The GALFAN coating is similar to galvanisation but with a superior zinc / aluminium alloy that protects the steel wire from corrosion / rust. Each Gabion basket kit is supplied with 6 mesh sides, 12 helicoil spring spirals and wire bracing strengtheners.We currently stock 5 standard sizes of Gabion mesh baskets that are supplied flat packed from 0.5m x 0.5m x 0.5m, 1m x 1m x 0.5m, 1m x 0.5m x 0.5m, 1.5m x 0.5m x 0.5m and 2m x 1m x 0.5m. Each basket has 75mm / 3” mesh apertures and are made from 10swg steel wire. 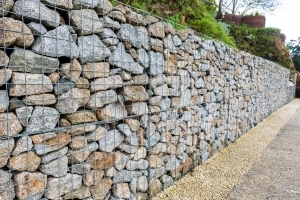 For every 1 metre of eight of a Gabion mesh wall, the base must increase by 0.5m. For anything above a 3mtr height, you should consult an engineer as slope stability calculations will be required.